...Is Russell Wilson on his way out of Seattle? 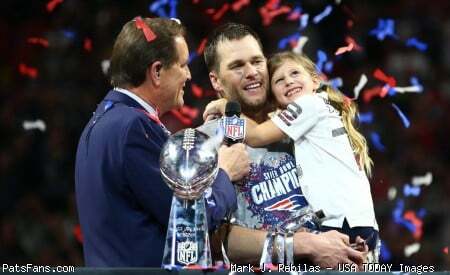 Discussion in 'PatsFans.com - Patriots Fan Forum' started by Froob, Apr 15, 2019 at 7:39 AM. I think Wilson was one of the most efficient QB's last year & Seattle has nowhere near cap hell lol. They have a ton of money to spend over the next 2-3 years. Some of you may want to stop now bc life after Tom will ruin most of the fans I see nowadays. He’s not a leader in anyway. That was made clear by everything that was coming out of Seattle the last few years. He’s been CARRYING them? To what exactly? They squeaked in a wild card spot last year and missed the playoffs the year before. Fair enough. Now let’s make this simple. Would you want Wilson as your QB?? I think Mahomes might be coming back down to earth. Teams will learn how to defend him and the only reason he makes some of his unconventional throws is because he's young. His arm can't take that forever. No one on this board has any idea what the career trajectory will be for Mahomes. What I do know is Mahomes is talented and has received good coaching. Thats key. Can he produce with lesser talent surrounding him? Not sure. Marino started off guns blazing and he cooled off once Duper, Clayton and others started to age. He had good coaching as well. TB12 started off as a game manager who became the GOAT. Coaching has been the same and the talent around him has been good to excellent. If Brady retired today and we could just take Wilson or Mahomes, who would it be? I'd take Mahomes knowing the huge risk. It's perceived upside for me. And I'd also be excited today as well if my man Wilson walked thru the door Brady walked out of. Not over the QB who's currently on my team! Small sample, but arguably the most successful QB ever against BB. High level passer, scrambles to pass rather than run & incredibly durable. If Wilson continues his feud with Seattle through 2020/2021 (franchise tags) watch out for Bill. Only one interception in three games against the Pats, but an interception that no one will forget. wilson is a qb you can build a franchise around. hes worth the money. seattle needs to remember the charlie whitehurst experiment. Dude, it’s one good season. Give me a break. It does Forehead a disservice. He’s 5-times NFL MVP. I’m torn. You’re right, but Mahomes showed more grit in his one really tough playoff game than I’ve ever seen from the front runner/playoff pants p1sser. They'd be foolish to let him go and go back to the Matt Flynn's of the world. I'm kind of loving this ... I don't believe he is worth the money. They won their Super Bowl year with defense. There was a time when Colin Kaepernick looked like a worthy adversary after literally beating the snot out of the Patriots in Foxboro 2012. Mahoney looks great - no doubt. But he needs to maintain his level of play for a few seasons, stay healthy, and register a win against NE before he is annointed. OK Cousins, this is a 'tease" for my 10th annual DW Toys "Trade-A-Rama" but it makes sense. The Hawks are in CAP hell. They are at $10,897mm. Schneider is desperate for picks in this Draft. They have only 4 picks in a pretty sporty Draft class. We know even though he praises Carr, Gruden is not necessarily tied to Carr and lip service has been underwhelming. The Raiders also need an edge rusher. My DW Toys"Trade-A-Rama" super-duper Trade? A shocker! The Hawks now have new CAP room. They move a QB who wants to leave Seattle and CA and Vegas will suit Russ and the Mrs. They could not pay for Wilson. He set a deadline. The best they get if he leaves is a 3rd comp. AB was best when Ben extended plays. That is what Wilson can bring to the table. They would only get a 5th round comp pick cause of the Alan Faneca rule. And if the Chiefs get called on their pick play the Ford offside would not matter. Can we not play the "if" game at all. Lets just give praise to the players based on what happened and not what could happen. They are not in cap hell at all. They have over 97m of space next season. The exact amount they have this year is meaningless as they can redistribute money with restructures if push comes to shove. This is not what cap hell is. Schneider cares more about signing his franchise QB than another draft pick this year. The entire point of the draft is to find players like Wilson. All this is right now is posturing about guarantees. The Seahawks dont want to set a precedent because every other important player will ask for similar things in the future. And Wilson's agent wants to force the issue. The Seahawks have more open cap space right now over the next 2 years than the Raiders. Your entire premise that this makes sense because of financial reasons is flawed. That being said I am not sure I would even be a fan of this from a Raiders POV. You give up 2 first round picks where one should be a guaranteed difference maker in the top 5 and another midround pick which are both under cost control for 5 years for 2 players that will need market setting contracts ? Not my kind of deal..
Russell Wilson hasn’t won anything since 2013; true. However, he’s an elite QB & is very underrated IMHO. He’s been carrying the SEA franchise ever since the LOB hey-days. Highly intelligent football player, extremely mobile, leadership ability, poised, tough, championship pedigree & can sling it with the best of them. His Achilles heal is fumbling. Yeah, Mahomes is exxxcellent, but he also fell into the perfect situation/scheme with Andy Reid, a loaded offense & D with 3 excellent pass rushers. Not ready to anoint him just yet. Remember, this is the proverbial “sophomore slump” year for Mahomes. His first year, he only played sparingly. Wilson has been CARRYING that franchise with like 2 weapons, no running game & NO O-LINE. Carrying the team to...just above mediocrity? An average offensive PPG? A fake passer rating that’s usually pumped up in garbage time? There’s a reason they have “no offensive line.” The little midget runs around and plays backyard football, can’t read a defense, and is very slow to process plays. Every time there’s a do-or-die play, Wilson’s signature play is a lollipop down the sidelines or some other deep bomb...that tells you the type of QB he is. He’s usually a bust for 2-3 quarters a game and then gets on a hot streak. Mahomes is already much better than Wilson. He led the Chiefs to the #1 offense in the NFL. Wilson at his best is capable of leading an offense to the 8-10 range, and his skill players have always been just fine. Everything you need to know about how overrated this guy is...last year’s playoff game. He played like absolute, total garbage all game until two garbage time TDs in the waning minutes. The fan base acted like he played a heroic game only to be let down by his defense, while the opposite was true. Carrying the team to...just above mediocrity? An average offensive PPG? A fake passer rating that usually pumped in garbage time? There’s a reason they have “no offense since line.” The little midget runs around and plays backyard football, can’t read a defense, and is very slow to process plays. I have no skin in this but if you ask me Wilson is a pretty good QB who can make all the throws, is a threat on the legs and is better at risk management than bozos like Winston. He never had a good offensive coordinator in his pro career, is stuck behind awful OLs and a HC that keeps living through the running game (except ironically on the 1 yard line in the SB). Given his experience, I think he would have been easily better than Mahomes last year with the easy mode offense KC had. Really dont understand the hate he is getting from a football perspective. In terms of his personal life he might be an even bigger weirdo than Brady and his TB12 pijamas. Wilson announced on Twitter that he’s got a deal. I suspect we’ll here details in the morning. They need to keep enough space free for Bobby Wagner for next year. I could see the Colts or Chiefs being in on Clark. Or the Jets perhaps (although I don’t know if he’d fit their 3-4). If it’s the Colts, I wonder if we could persuade them to let us have Jabaal Sheard back? I don’t have a link at the moment, but I read a report stating that Buffalo was very interested in Clark, so they may be a team to keep an eye on regarding a potential trade.